Collecting leachate from a capped landfill siteFar from being a load of rubbish, landfill sites should be considered one of the great untapped resources in the search for new enzymes for biotechnology, and could fuel more efficient biofuel production. 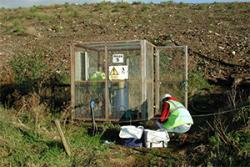 A new research paper in mSphere (DOI: 10.1128/mSphere.00300-17) by biologists at Bangor and Liverpool universities has for the first time identified the enzymes which degrade natural materials such as paper and clothing in landfill sites. Cellulose and lignin occur naturally in plant-based materials and take longer to decompose than other waste products. As a result of this, the majority of landfill waste consists of lignin and cellulose. In their plant form, they can be used as the basis for biofuel production, and identifying more effective enzymes for this process would improve the yield from this source. Scientists have been searching for a number of years for the most effective enzymes which break down the cellulose and lignin within the residual natural fibres. The obvious place to search has been in the rumen of sheep and cows, who eat grasses, and the guts of also other plant eaters such as elephants and termites. 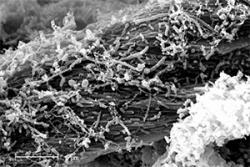 Electron micrograph of microbes from a landfill site colonising and degrading cellulose.Surprisingly perhaps, landfill sites share many of the same characteristics as the digestive systems of these animals: they are dark, anoxic or un-oxygenated spaces, with a high content of cellulose. It was therefore to landfill sites, which are artificially created ‘systems’, that this group of scientists turned to find new plant-degrading enzymes. Within in the paper, the authors describe how they used the liquid or ‘leachate’ within landfill sites as a source of microbes to decompose cotton, and analysed not only the families or taxa of bacteria, but also identified which bacteria produce groups of enzymes to degrade cellulose.